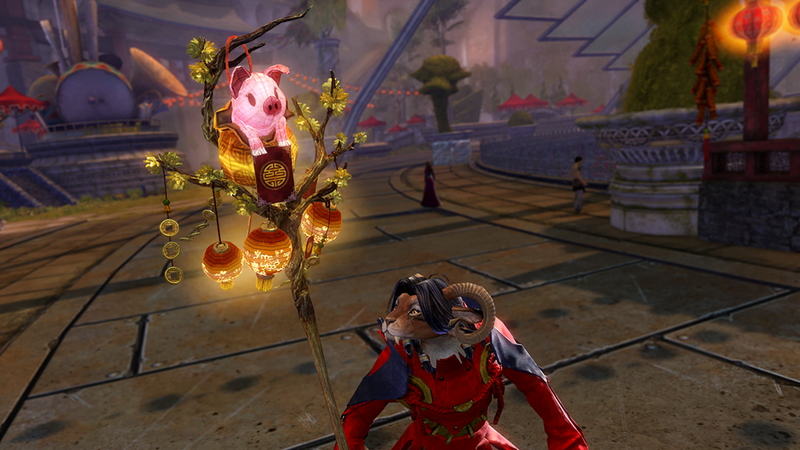 ArenaNet’s MMORPG Guild Wars 2 is celebrating the Lunar New Year with a return of the celebrations. The event takes place in the Human capitol of Divinity’s Reach, and many familiar activities are returning. Players can participate in the fast and furious Dragon Ball PvP mini-game, Firecracker Adventures, and mount races to collect Lucky Envelopes. When opened, these little red packets may reward you with firecrackers offering boons and boosts, delicious food with stats, Gold and rarer items like components needed to craft a Lunar Bag piece. Additionally, the Black Lion Trading Chests found throughout Guild Wars 2 have been updated to the Fortune Favor Chest. Inside each festive chest, you’re guaranteed to find the Evon Gnashblade Lucky Envelope, a redeemable Black Lion Statuette, and two common items. You also have a chance to discover something rarer in the fifth slot, including exclusive items and glyphs, and skins from the Crimson Lion Weapon Collection and Dragon’s Jade Weapon Collection. Skins from the Zodiac Weapon Collection are available from Black Lion Weapons Specialists for three Black Lion Claim Tickets each. You can now purchase your favorite Lunar New Year miniatures with Black Lion Miniature Claim Tickets. Exclusively in the Guild Wars 2 Gem Store, there’s a brand new staff skin awaiting players who want to go all out celebrating the Lunar New Year. The Staff of Fortune is colorful, bright and epitomizes the Year of the Boar 2019.